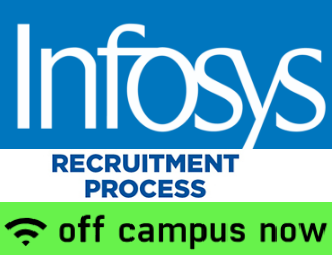 Infosys Recruitment Process: Infosys registration for Pool Campus Drive 2019 is open now. If you not applied to the Infosys Pool Campus, then use this Infosys Off Campus Registration Link here to apply. Here we have published the latest selection process of Infosys for Freshers Recruitment. The Pool Campus or Off Campus Drive is nothing but combined recruitment for a group of colleges or all. But when compared with On Campus, the off-campus drives are difficult due to of the big competition from all pass outs from various disciplines and specializations. So candidates have to work more to get success in the Recruitment Drives especially for Infosys Recruitment Process. Let's have a look into the Infosys Recruitment Process for Freshers in detail here. Also, Please note that this information collected from the basis of the previous experiences of the fresher candidates who appeared for the Infosys Off Campus Placements. We can say this is the general recruitment pattern followed by almost all IT companies for Freshers Recruitment through Campus Drives. Even the Recruitment pattern remains the same for every company, but candidates can observe the changes in Aptitude Test Pattern from one IT company to another IT company. So candidates are required to know the Infosys Test Pattern in detail. The Aptitude Test Pattern for Infosys Off Campus contains 65 questions. The test can be either through online mode or offline mode. But prepare as you are attending for an Online Exam. The one good thing in Infosys Aptitude Test Pattern is no negative marks. Candidates have chances to score even they don't know the answer, but the sectional cutoff is more 70% in the Infosys Online Test. The following is the pattern for Infosys Off Campus 2019. Candidates who score at least a 70% in each section will be qualified for the next rounds in the recruitment process. The next rounds include Technical Interview Round and HR Interview Round. 1. Explain the concepts in C Language like Loops, Arrays, String Functions, etc. 2. Explain about your final year project? 3. You can also ask to write syntaxes and semantics. 4. You can also ask to write a piece of code on paper with the logic explanation. The HR Interview in Infosys Recruitment Process is to check the candidate's decision-making skills, communication skills, and other employability skills.